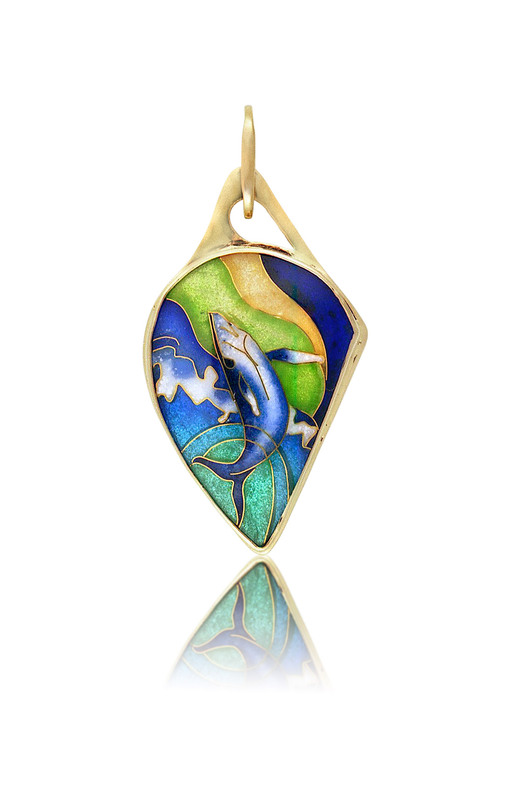 Cloisonne jewelry – enameled whale, set in an 18k gold pendant. Living in Hawaii gave me the privilege of viewing these beautiful giant breaching whales, Humpbacks. Even if you were not looking for them while sitting on the lanai, beacause you could hear them slap their tail on the water’s surface. The North Pacific Humpback Whales (Kohola) arrive in Hawaii after their long journey from Alaska, sometime from November to May, with most sightings January to March, making February the peak time. The more than a 3,000-mile journey is believed to take them as little as 36 days up to 4-6 weeks one-way. Humpback Whales leave the icy waters of Alaska during the fall for warmer waters to mate, give birth, and nurture their calves. Not only does Hawaii offer warmer waters but a few other perks could be the underwater visibility, the variety of ocean depths, and the lack of natural predators. As an advanced diver and the love of the ocean you can call on me anytime to create you an awesome cliosonne enamel necklace to honor these beautiful breaching whales!